GG Abseil Services are one of eight trading divisions within the BLOORIE Group. As a Group we have over the last 28 years consistently delivered cost effective high level glazing solutions to the UK Construction Industry. 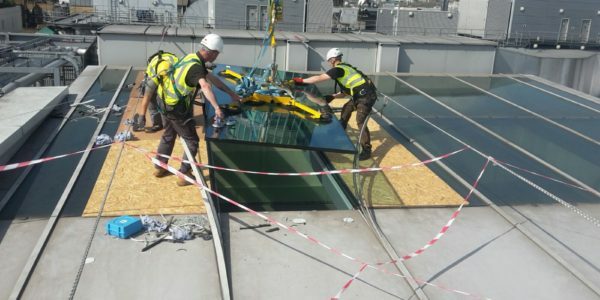 Our teams of IRATA trained technicians are highly skilled glaziers and tradesmen, supported by in-house professional Project and Site Managers. We’ve worked hard to gain multiple industry standards to ensure our Group operates efficiently and safely. These memberships include The Glass and Glazing Federation (GGF), SafeContractor, CHAS and both ISO9001 and 14001 standards. We are approved Contractors and Partners with some of the leading Construction and Property Companies within the UK marketplace and we are proud to have maintained and developed commercial working relationships with these Companies throughout the years.